NO Muscle Pump increases the production of nitrogen oxide, facilitates blood supply to muscles and transports of nutritive components directly to muscles. 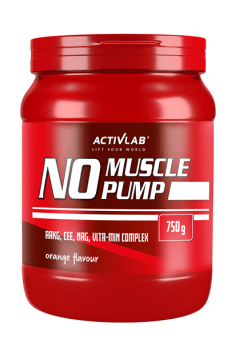 NO Muscle Pump is formulated with an energetic matrix containing selected carbohydrates such as taurin, caffeine, inositol and a complete set of vitamins of B group. Its advantages include: prolonged duration of training; improved energetic transformation and use of carbohydrates; shorter time of post-training regeneration. NO-Muscle-Pump is additionally enriched with carefully selected, most important electrolytes such as: potassium, chlorides, calcium and magnesium, therefore it is an ‘all-in-one’ preparation, indispensable to every sportsperson, practicing both professional and recreational physical exercise. Use once a day, preferably 30 minutes before training. Due to the use of the product it's recommended to use it only prior to a planned physical activity. Mix portions of 50 g (2 scoops) in 200 ml of water and consume 30 minutes before workout. Maltodextrin, glucose, L-citrulline malate, L-arginine, L-arginine alpha-ketoglutarate, L-arginine pyroglutamate, creatine monohydrate, creatine malate, creatine ethyl ester, L-glutamine, N-acetyl-L-glutamine, alpha-ketoglutarate L-glutamine, glycine, L-tyrosine, taurine, anti-caking agent E551, acidity regulator - citric acid, flavors, sweeteners: E951 and E950, caffeine, inositol, potassium chloride, calcium phosphate, magnesium carbonate, thiamine mononitrate, riboflavin, acid nicotinic acid, calcium pantothenate, pyridoxine hydrochloride, D-biotin, pteroylmonoglutamic acid, cyanocobalamin, coloring: E104 (lemon and orange flavor), E110 (grapefruit and orange flavor), E124 (grapefruit flavor).